Onto the running. It’s been an OK week – 55 miles done and my achilles has felt OK. I have a confession to make. I have an addiction. I have tried to kick it, to go cold turkey and hope that it will leave my system and free me from the compulsions that afflict me, but no, that has never worked. I am addicted to buying running shoes. Before writing this week’s blog, I checked the wardrobe in my spare room and I currently own 14 pairs of useable running shoes. I suppose I’m a sort of athletic Imelda Marcos. I buy most shoes online and I am a creature of habit – always Saucony Grid Omnis size 9.5 for my basic heavy trainers, I must have owned 20 pairs of them over the years; and Asics DS-Gel for my fast training and racing shoes – I have two pairs of DS-Gel Trainers that I use for interval training sessions and longer races (10 miles and longer). I also have a pair of super light DS-Gel racers – which I wear for short races. They weigh virtually nothing because they have virtually no cushioning or support. I wouldn’t dare wear them for anything longer than 10K because of the risk of injury. I planned to run the Manchester marathon in my DS-Trainers, but both pairs I have are getting a bit past it. I saw that Sportshoes.com had some 2013 DS Trainers on offer at just under £50 (i.e. half price) with 1 pair left in my size. A few days after ordering, a guy from Sportshoes.com phoned me and told me that they had no DS Trainers left, did I want to order something different. I ended up buying a pair of Brooks Pure Cadence in lime green also half price. Despite what the guy from the store said, two days later, both pairs turned up! Being the obsessive hoarder that I am, I decided to keep both. I had never owned a pair of Brooks before and I tried them out at the Tuesday night Valley Striders session. They felt great – light yet supportive and springy and for the first time ever I managed to cover at least 1 full mile inside 6 minutes for the 5 reps of our 5 by 6 minute session. I have my new marathon shoes! I ran the Leeds parkrun on Saturday in 18.40, my best time of the year. I was pleased because it was a hard but not full gas effort. Once the weather is warmer and stiller, I know I can go much quicker. I ran the identical time 12 months ago on a much stiller day. It wasn’t all bad though, because in the provisional results, I have finished 2nd Male Vet 45, so I might get a few quid for that. A sub 60 minute time was never on for me today – only the top ten guys achieved that – 12 months ago 41 runners achieved a sub 1 hour time. I’ll try again at Thirsk on March 23rd. 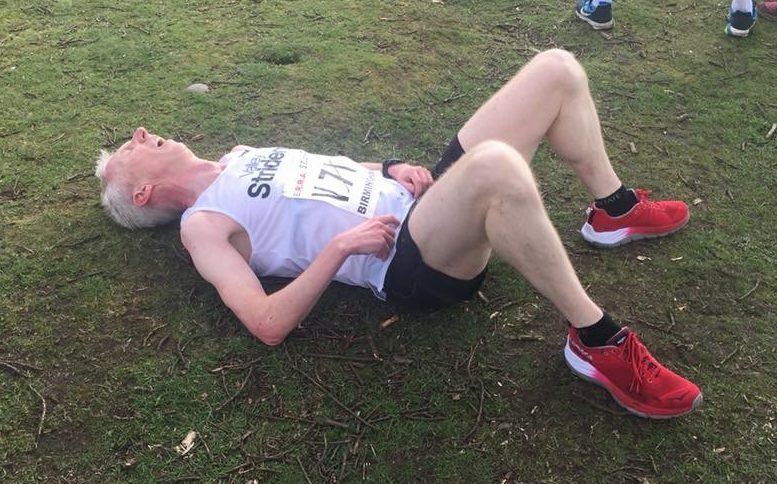 With six weeks before my sub three attempt at Manchester, it would seem a good time to undertake a review of the training so far. Overall, the project is green, I have done three proper long runs and significantly increased my training volume, and though I haven’t quite run as many miles as I planned to, I’m not far below target. I have done at least one interval session every week and I have some really solid race results, including a really pleasing PB run in the Brass Monkey Half marathon. I have 4 weeks of heavy training and then I will ease off for a two week taper. Next week I’m hoping to do a 22 or 23 mile long run, which will be my longest training run. The week after, I have the East Hull 20 mile race, which will be done as “a catered training run” to borrow Tom Williams’ phrase. Please God, No colds !! Unfortunately, a number of my teammates have succumbed to injuries or illness and one or two are doubtful for Manchester. It’s an occupational hazard for runners, but I really hope that we all make the start line in 6 weeks time. Good work James. I’ve discovered Adidas running shoes suit my gait and running style really well, thus ive just purchased my 3rd pair in 2014 alone!!! Been knocking down PB’s all over the shop since. I was on for a sub 70 yesterday, but at 6 miles like you got knocked square on the chin by the wind, and was 30 m behind a cluster 0f 10 or so runners. Despite me best efforts I couldnt catch up to them. Still 72 min, big PB for me. Well done Sean on the PB, the wind was definitely worth a couple of minutes at least I think.